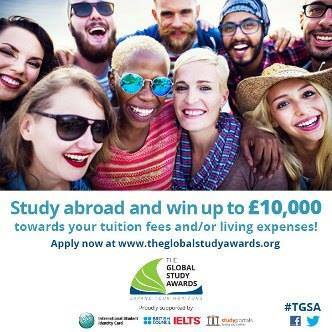 British council in Collaboration with ISIC Association a non-profit organisation, IELTS the International English Language Testing System and StudyPortals the international study choice platform hereby present THE GLOBAL STUDY AWARDS. Over a six month period, two study award announcements will be made, with a maximum of three Study Awards granted to students at each announcement point (maximum nine awards in total). The six month time span allows for consideration. *Their sincere interest in increasing intercultural understanding and exchange. *Have a valid International Student Identity Card (ISIC) and/or International Youth Travel Card (IYTC) at the time of application. *Plan to enrol on a full-time undergraduate or postgraduate programme abroad in the academic year starting January 2016 onwards. *Provide an acceptance letter from the relevant institution by the relevant cut-off date.